Bhai Dayal Das (variously spelt as Bhai Dyala, Dayala, Diala)( was one of the earliest and greatest Martyrs to the Sikh faith. Along with his companions Bhai Mati Das and Bhai Sati Das as well as Ninth Guru, Guru Teg Bahadur, Bhai Dayala was martyred at Chandni Chowk at Delhi on 24 November 1675 on account of his refusal to barter his faith. He was the third Sikh to be executed by the Mughals in November 1675 before the Martyrdom of Guru Tegh Bahadar JI . His grandfather, Bhai Balu Ram had attained martyrdom while fighting in Guru Har Gobind Ji’s first battle of faith against the Mughals. His ancestors belonged to Alipur near Multan. Bhai Mati Das came to Kiratpur for an audience with Guru Har Rai in 1657 A.D. Returning home, he left his three elder sons for service of the Guru’s institution. Bhai Dayal Das was fifteen when he entered the Guru’s institution. On recommendation from Diwan Durga Mall, Guru Tegh Bahadur ji made him minister for domestic affairs. In 1665 A.D., when Guru Tegh Bahadur ji went to Assam from Patna, he left him at Patna to look after his family. The birth of Guru Gobind Singh ji took place under his care and service and he looked after the prince till he reached Anandpur Sahib. After sending the Kashmiri Brahmins back on the 25th May, 1675 A.D., Guru Tegh Bahadur ji decided to go to Agra to court arrest. Before leaving Anandpur Sahib, he asked his principal devotees to ask for any blessing they had at heart. All were unanimous in their reply, ‘That we be granted permission to accompany you to Agra.” Bhai Dayal Das was also one of those Sikhs who had been arrested ahead of the Guru. Bhai Dayala was one of those great Sikhs who accompanied Guru Tegh Bahadur ji when the latter left Anandpur on 11 July 1675 to court martyrdom at Delhi, the other two were Brahmin brothers—Bhai Mati Das, a Dewan and Bhai Sati Das, a Scribe at Guru’s court. Along with Ninth Guru ji, they were arrested under orders from Emperor Aurangzeb at Agra. At Delhi, the Guru and his four companions were summoned into the council chamber of the Red Fort. The Guru was asked numerous questions on religion, Hinduism, Sikhism and Islam. It was suggested to the Guru that he should embrace Islam. On the Guru’s emphatic refusal to abjure his faith, he was asked why he was called Teg Bahadur (gladiator or Knight of the Sword; before this, his name had been Tyag Mal). Bhai Mati Das immediately replied that the Guru had won the title by inflicting a heavy blow on the imperial forces at the young age of fourteen. He was reprimanded for his breach of etiquette and outspokenness. As Mati Das was a Brahmin, the Guru was asked why he had courted the company of such men when he did not believe in caste, and why he was defending the Brahmins of Kashmir. The Guru replied that when a person became a Sikh, he lost his caste. As for the Kashmiri Pandits, it was his duty to raise his voice against cruelty and injustice. The Guru and his companions were ordered to be imprisoned and tortured until they agreed to embrace Islam. After a few days, Guru Teg Bahadur and three of his companions were produced before the Qazi of the city. Gurditta had managed to escape. He remained in hiding in the city, and in spite of all the efforts of the Government, he could not be traced. The Qazi turned to Mati Das first and asked him to embrace Islam. He refused to do so. He was condemned to an instantaneous death. SeeMati Das for details of his martyrdom. At Delhi, the Guru and his four companions were summoned into the council chamber of the Lal Kila (the Red Fort}. The Guru was asked numerous questions on religion, Hinduism, Sikhism and Islam. It was suggested to the Guru that he should embrace Islam. On the Guru’s emphatic refusal to abjure his faith, he was asked why he was called Teg Bahadur (Brave Swordsman). Bhai Mati Das immediately replied that the Guru, then named Tyag Mal, had won the title by inflicting a heavy blow on the imperial forces at the young age of fourteen. He was reprimanded for his breach of etiquette and outspokenness. As Mati Das was a Brahmin, the Guru was asked why he had courted the company of such men when he did not believe in caste, and why he was defending the Brahmins of Kashmir. The Guru replied that when a person became a Sikh, he lost his caste. As for the Kashmiri Pandits, it was his duty to raise his voice against cruelty and injustice. The Guru and his companions were ordered to be imprisoned and tortured until they agreed to embrace Islam. The executioners were called and the Guru and all the three of his companions were made to sit at the place of the execution. Bhai Mati Das approached the Guru with his palms pressed together , as he asked for his blessings, saying that he was happy to be the first to achieve martyrdom. Mati Das while standing erect was tied between two posts. He was asked if he had any parting words, to which Mati Das answered, “I request only that my head be turned toward my Guru as I am executed.” Two executioners placed a double-handed saw on his head. Mati Das serenely uttered “Ek Onkar” and started reciting the Japji Sahib, the great morning prayer of the Sikhs. He was sawn in half from head to loins. It is said that even as the body was being sawn into two, the Japji continued to reverberate from each part until it was all over. Bhai Dayala heroically accepted the latter alternative and asked leave of the Guru. The Guru said, “Brother, your service has borne fruit due to which your turn has come before mine. Great are you and blessed is your devotion. What pleasure can be greater for me than to see my lifelong devotees sacrificing their lives for the protection of human rights even ahead of me? May God bless you with success.” The Guru graced Bhai Dayala for his lifelong devotion as a true and dedicated Sikh and blessed him with glory and success. Again, Bhai Dayal was asked for a final time if he would leave his faith and embrace Islam. Bhai sahib defiantly and consistently answered, “No!” to the qazi’s repeated requests. This infuriated the qazi who pronunced his immediate torture and death. 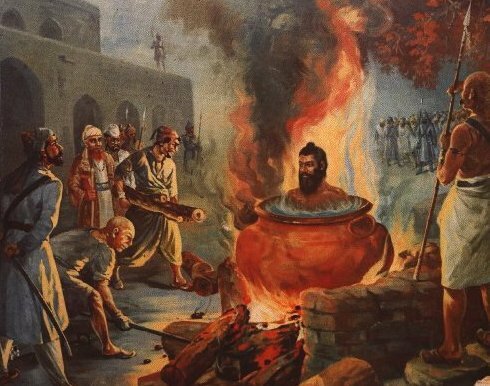 The executioners sat Bhai Sahib in the cauldron of water under which a large fire was lit. Slowly the water was let warm; then it was hot; soon it was too hot and then it was boiling. Bhai Dayala continued to his last breath to recite the Japji of Guru Nanak Dev ji and the Sukhmani of Guru Arjan Dev JI . He stayed on, sitting in the water, with an unwavering mind. His flesh separated from his bones and his soul departed to merge into the Supreme Being.